The first step to creating your own custom C-MAP Genesis contour maps is to record sonar logs created with sonar signals (soundings) from the transducer on your own boat. This article provides easy-to-follow, step-by-step directions to do that with compatible* Lowrance sonar/GPS units. Repeat the process detailed below every hour to 90 minutes on the water. Genesis servers can more quickly process 6 one-hour files than one 6-hour file. After selecting “Log Sonar…” a pop-up window will open containing several entry fields. The instructions below will explain which entry fields will require your attention in order to create the best sonar-log recordings as possible. This will open a screen with a name field and a “Qwerty” keyboard. Simply touch the keys on the keyboard to add or delete letters, as needed. “slg (Sonar only)” – Records only your 200 kHz (2D) sonar for playback later in the C-MAP Genesis trip-replay pane. “xtf (Structure Only) – DOES NOT WORK WITH C-MAP GENESIS! DO NOT CHOOSE! “sl2 (Sonar & Structure)” – Records both your broadband 200 kHz (2D) sonar AND your Down-Imaging signal for playback later in the C-MAP Genesis trip-replay pane. “sl3 (includes StructureScan 3D) – Records your broadband 200 kHz (2D) sonar data, your down-looking StructureScan data AND your side-looking StructureScan data. At present, however, side-looking sonar data is not integrated into C-MAP Genesis. NOTE: Almost any off-the-shelf SD card 32g or smaller will work. You do not need an expensive, specialized card. A 64g card will not work in most Lowrance units. “Create StructureMap” – This is not a setting that will currently affect your C-MAP Genesis log. However, future versions of C-MAP Genesis may incorporate data generated by clicking this box, so you can click it if you want to. If you are recording sonar with an HDS Gen3 or a Gen2 with a WiFi-1 accessory, you have the option of uploading your sonar logs directly from your chartplotter, from the boat on the water, in the marina, or in your garage or driveway (etc), provided you have a wifi signal (through your smart-phone, marina, or home network, etc). NOTE: No matter which setting you choose, waypoints, trails and tracks are NEVER uploaded, as that data is not even included in the sonar signal that is recorded from your transducer. With either setting, another person or entity will NEVER have access to your waypoints, trails or tracks. “Time remaining” – Shows you how many more hours and minutes of recording time remain on your SD card. No need to push any buttons here. If the “Start Logging” button highlights in blue with the words displaying in white text, push the “Enter” button. You are now recording (AKA “logging” your sonar). A blinking red button will appear on the upper right-hand corner of your screen. If the words “Log Sonar…” display in black text within the blue highlight, that indicates that you do not have an SD card loaded into your card slot, and you will not be able to activate the button and begin recording. If you encounter this, turn off your unit, insert a mini-SD card and repeat the steps above. To stop recording a sonar log, follow these steps below. Note: The “Stop sonar” prompt will NOT stop your sonar-log recording. It WILL turn off your transducer, preventing it from sending and receiving sounding signals and calculating your vessel’s depth. You’re going to want to select the “Stop Logging” prompt. 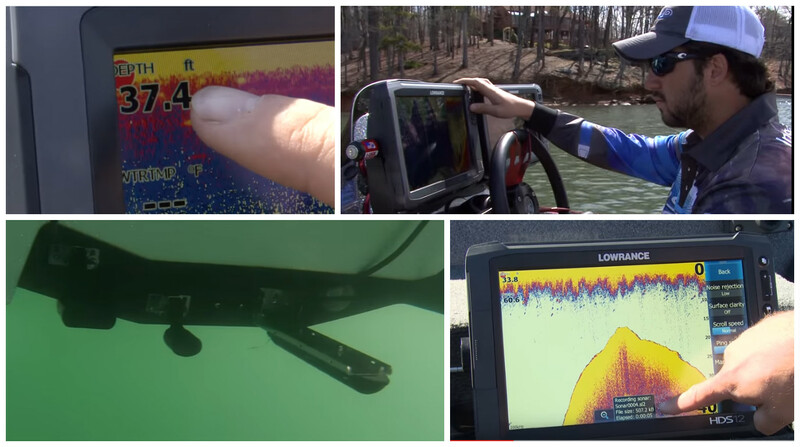 The directions below will explain how to find it, no matter which Lowrance unit you are using. Scroll down until “Log sonar…” is highlighted in blue, then click the “Enter” button. Congratulations! You’ve just learned the first step in creating your own custom contour maps. The second step is registering for a free C-MAP Genesis account (Click HERE to do that). 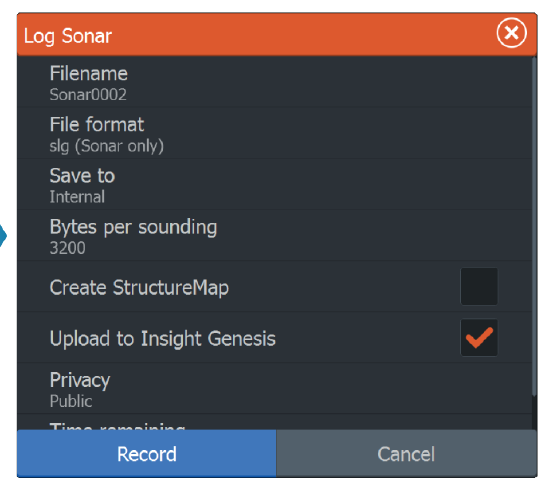 The third step is to upload your recorded sonar logs to the C-MAP Genesis cloud for review in your C-MAP Genesis dashboard. (Click HERE to learn how to do that). 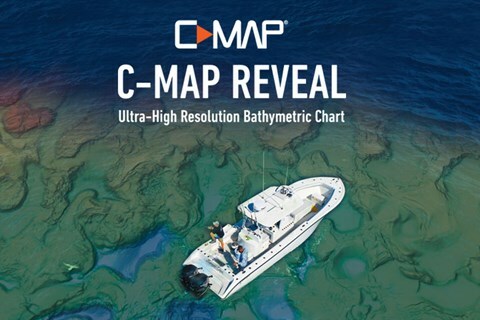 * To use C-MAP Genesis maps on the water, you’ll need a compatible Lowrance, Simrad or B&G chartplotter.